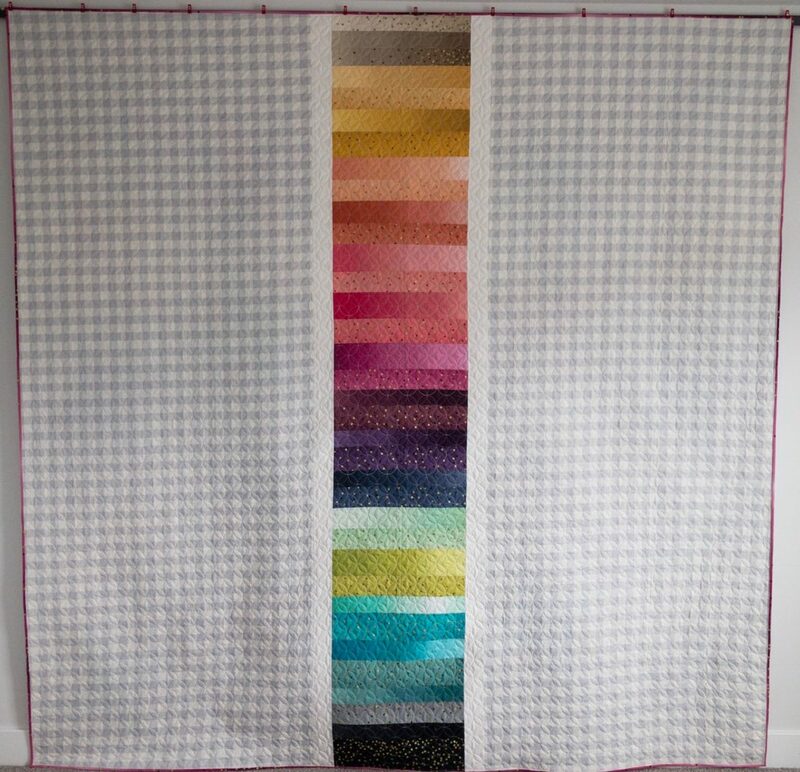 A few of you have seen the progress shot of this quilt back on Instagram. Here’s the back story behind why it even had to come to be. 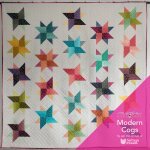 For an upcoming Moda Bake Shop quilt, I was not sent enough backing. I had originally asked for a 108″ wideback but was sent something different. It was an honest mistake, but it left me about 3 yards short of what I needed to have for backing for this particular quilt. As panic set in and I wasn’t sure what to do next, I had started tossing around the idea of using leftover pieces to put in the middle of my backing. A friend had recommended this and as I was already thinking about doing that (just not sure how exactly to execute it), she sent me to go look at @hello.erikabea on instagram. I already follow Erika, but I don’t know that I had ever noticed her beautifully thought out pieced backings. 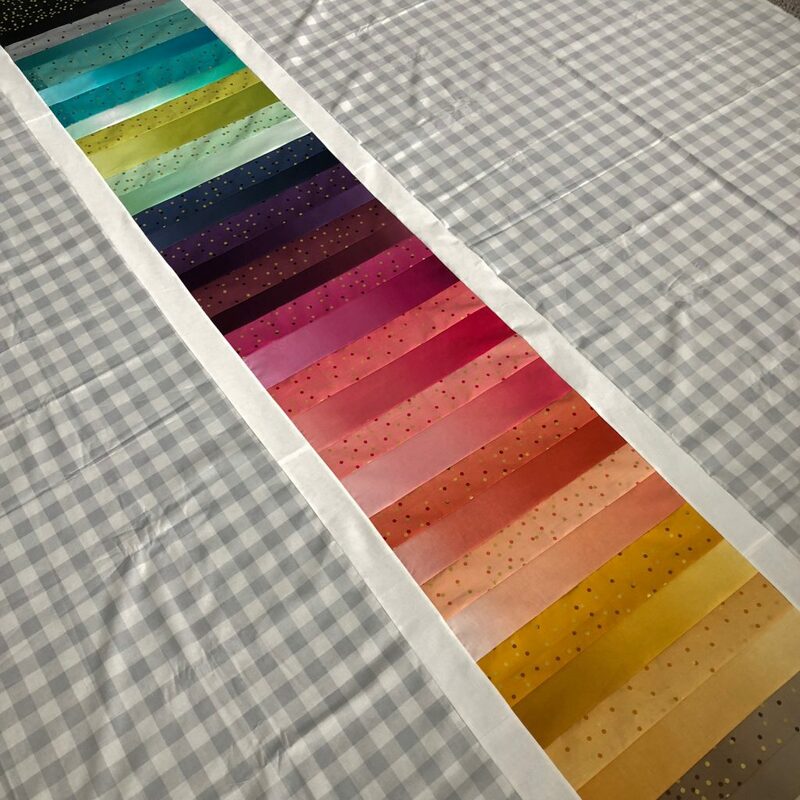 To make this backing, I grabbed all of my Ombre Confetti Metallic big chunk scraps I had and started laying them out in the order in which they come as packaged by Moda. I quickly realized I would not have enough and then I remembered that I had a gallon sized bag about half full of original ombre scraps. LIGHT BULB! 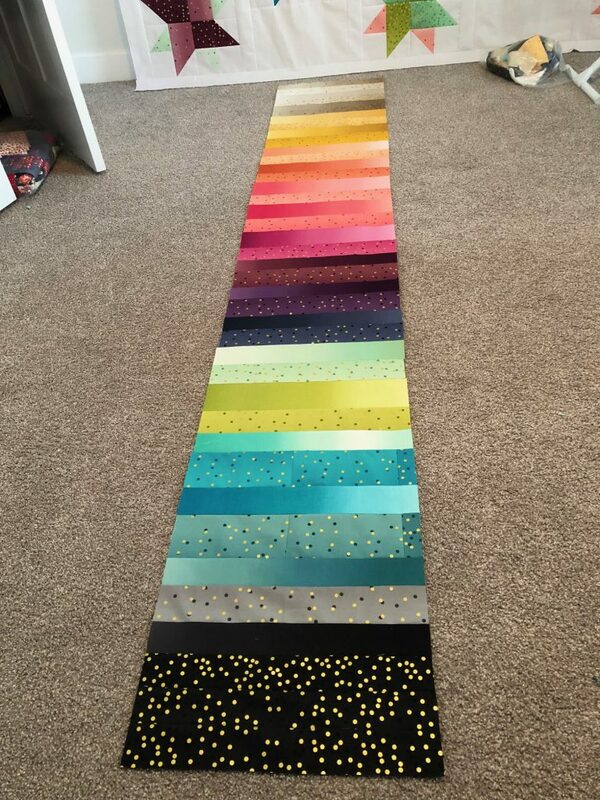 I had a bunch of jelly roll strips from a past project as well as some bigger chunks. Guess what? The bigger chunks were all about the same size as my ombre confetti scraps! 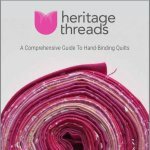 I thought I’d share this here as a potential to use up some of those 2.5+” x 18″ or 2.5+” x 21″ scraps left over from cutting out fat quarters. I have suuuuuch a collection of those random sized strips from past projects I could make probably all of my backings this way. 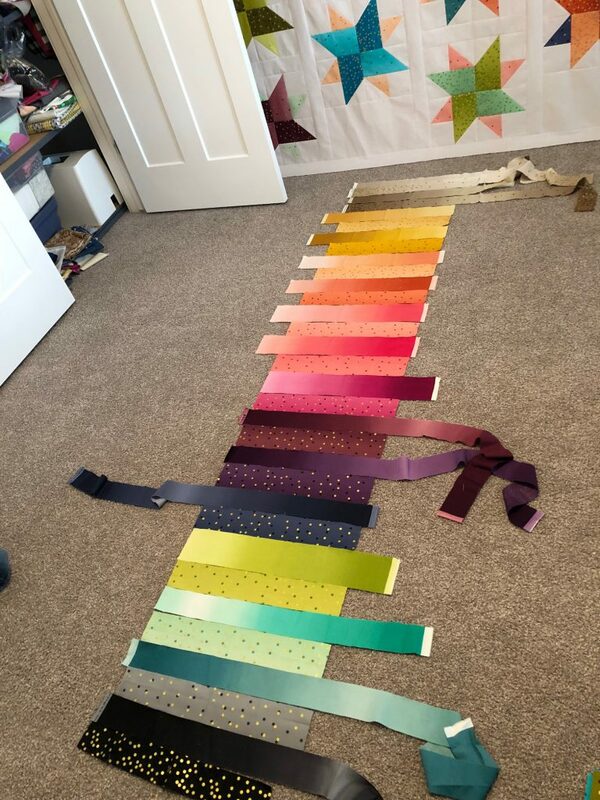 To assemble, I just laid out my scraps in the color order I wanted and sewed them together in chunks of 6. After I had done this, I did some assessing and figured out what width I should trim them down to. I believe it was around 16.5″, but you could certainly have larger or smaller width and have this work out beautifully. 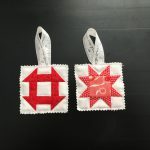 After I had these groups of 6, I continued sewing them together until I had a large strip. 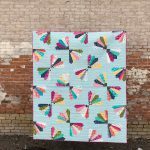 I knew that for the width I needed for this particular quilt top that finishes at 96″ x 96″, I would need to add a few more inches. I then cut some white solid strips that were 2.5″ wide, sewed them together, then attached them to each side of this pieced section. I then attached the actual backing to each side of this section and I was amazed at how much I LOVED this backing! The pieced section gives it just that special touch that would definitely have been missing had I used 108″ wide backing! 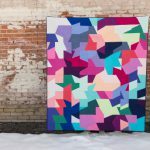 This quilt is truly reversible and like 2 quilts in 1. It has now been dubbed “The Backside Quilt” by a dear friend and I am so pleased with it! Do you normally add something special to your backings like this? This was a first for me and I know it will NOT be the last time I do this! 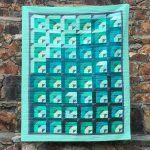 Your quilt backing is such fun! I try to incorporate fabrics from the front of my quilts in my pieced backings too. 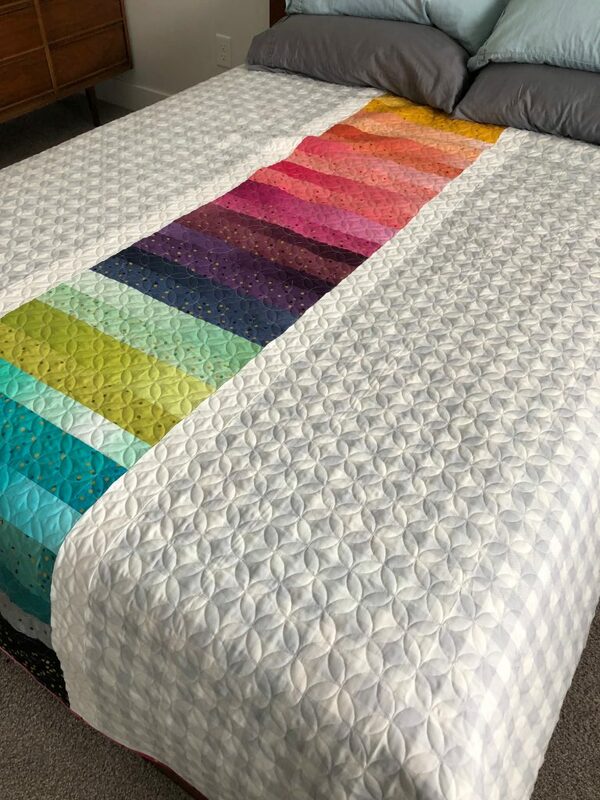 Your amazing quilting takes it to another level!